Astro Lighting Cabaret 4 light halogen bathroom wall fitting features 4 glass opal globes set along a polished chrome mounting bar. The product code for this Astro Lighting wall fitting is 0499, however a slightly larger switched 5 light wall fitting "0957" is available to order. The product code for this Astro Lighting wall fitting is 0499. This classical theatre dressing room style lighting is IP44 rated with a pull cord switch on the end of the fitting. This item is double insulated, suitable for bathroom use. 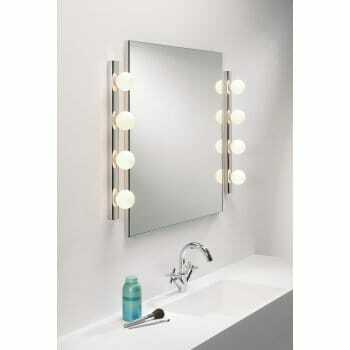 Please note the price is per 4 light set whereas the image shows a perfect arrangement with 2 sets situated either side of a mirror for that true Hollywood or West End feel. For a full look at our Astro Lighting Cabaret collection please see the section below for alternative colours and sizes or by searching the corresponding product codes mentioned above.